This was the year of the rookies, Lewis Hamilton being the most obvious and successful of them, but a crowd of hopefuls also making their mark in a sport that is slow to be impressed by new arrivals. Most of this season's bumper crop had their moments at center stage, leading many to suppose that they might have done as well as Hamilton, had they had his breaks. Yet I wonder if this is true. Are these new stars really all they are cracked up to be? Let's have a long, cold look at them and see how they have done in reality. Of them all, I think Nico Rosberg shows the most promise, although strictly speaking he should not be in this group, having had two years of F1 experience now. Perhaps that is why his performances have been both quick and reliable, only the weaknesses in the car preventing him finishing much higher up the order. He has certainly done enough to convince us that he will be in F1 for a long time to come and, if his father is anything to go by, he should shine now that traction control is being done away with. But Nico made his mistakes last year; in Hamilton's first season there were only two, although they resulted in him losing out in the chase for the title. Round one to Lewis, I think. Next up are the two Ks, Robert Kubica and Heikki Kovalainen, both maturing over the course of the year and accepted now as stars of the future. But Kubica has yet to gain ascendancy over his team mate Heidfeld, leading me to think that either he is not as good as we had thought or Quick Nick is a whole lot quicker than his reputation. Solid, honest and reliable, but not really in the top flight, that was the standard opinion on Heidfeld going into this year; it may be that we were wrong and Nick is one of the best but never had a decent chance before. Whatever the truth, we can say that Kubica is no better than Heidfeld, so I do not understand why he is so highly thought of. Yes, it made sense last year when he was regularly fastest of the test drivers and had an explosive entry to F1 racing when Villeneuve departed. But he was erratic at best in the first half of this season and took quite a few races (and the most spectacular crash of the year) to settle down and get to work. The verdict has to be that he is good enough for F1 but unlikely to be a champion in the future. Much the same can be said of Kovalainen, although he was quicker than his experienced team mate in the second half of the season. The fact that Fisichella's reputation as a quick driver is in ruins does not make this overly impressive, however. Once again, the best that can be said of Heikki is that he learned through his mistakes and can now be relied on to give a good performance. But future champion? I doubt it. Latest of the wonder boys is, of course, Sebastian Vettel. I have pointed out before that he has been distinctly underwhelming in the Toro Rosso team, failing to beat Vitantonio Liuzzi until two wet races and the right pit stop strategy gave him the points that made him a sensation. The reality is (and this was confirmed by Liuzzi's performances in Japan and China - with Vettel's luck, he would have garnered the points, not the rookie) that the Toro Rosso is inexplicably good in the wet and Vettel did no more (and probably less) than Scott Speed would have done. So I am unconvinced by Vettel. What of Adrian Sutil then? He made short work of bettering his team mate, Christijan Albers, right from the start and then went on to outclass everyone else the Spyker team put in the second car. 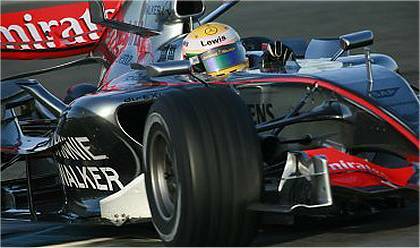 Although he had his share of mistakes, generally he looked quick and, towards the end of the season, was getting the 'B' spec car ahead of other teams - no small accomplishment in a Spyker. It leaves Sutil as potentially the best rookie of the year, with the exception of Hamilton, of course. But it is very early yet to get excited; let us see him with a team mate that we know is good and we will be better able to judge. Until then, the jury has to remain out. Then there is Anthony Davidson, the "veteran rookie" of the Super Aguri team. I had hopes that he would show Sato the way around but it has not turned out so. There were times when Davidson was quicker but just as many when Sato had the upper hand. And the Japanese driver was a little more reliable, although you could blame many of Davidson's problems on bad luck. Yet luck has a part to play in the making of a driver; add that to a lack of flair on Davidson's part and he does not look more than a journeyman driver for the future. Which leaves us with the one-race men, Markus Winkelhock and Kazuki Nakajima. Everyone remembers Spyker's moment of glory at the Nurburgring when Markus led the race in the pouring rain - yet we all know he was terribly slow in practice and the rest of the race and it is rare for any driver to be the only one on the right tire at the right moment. I doubt we will see Winkelhock in a GP again. Nakajima certainly made his mark in his one race for Williams, running over a couple of mechanics and then setting the fifth fastest race lap. It seems he is quick but a little inexperienced, therefore, and that is more than could be said for many drivers on their debut. But it would be foolish to see him as anything more than an interesting newcomer - he needs more races and perhaps another year of GP2 before we can form an opinion on him. So who would have done as well with all of Hamilton's advantages? I think the answer has to be none of them. To watch the precision of Hamilton's driving, the confidence, sureness of touch, the chances taken that come off with regularity, is to know that he is an unusual talent and would have been a sensation in F1 even without the years of grooming supplied by McLaren. It has to be faced: not even Rosberg could have given the double world champion as hard a time as Hamilton gave Alonso. I completely agree. I have to admit that I'm not the biggest fan of Hamilton in the world, but he's far and away the best rookie of the year, and very likely better than any rookie we have ever seen. In fact a comparison to past rookie sensations would be very interesting! I think he would certainly rate better than Jacques Villeneuve, my former racing hero and the other rookie sensation Lewis seems to be most often compared to. But I agree that for all the advantages Hamilton had by being in the Mclaren, I can't imagine the other drivers you mentioned giving Alonso as much difficulty as Lewis did, had they been in his seat. None of them had a reigning world champion as a team mate, none of them had the added pressure that must surely come from driving for a frontline team, and none of them made as few mistakes through it all as Lewis did! The guy is the real deal, and his WDC crown is only a matter of time. Pretty balanced that Clive. Are you writing off Mr Vettel a bit quickly though? I sense you still feel an injustice regarding Scott Speed and perhaps it shows in your appraisal of his replacement? He has had less drives than those that you are comparing him with, lacked the pre-season focus that they did and in my opinion showed good mental strength after his mistakes. Future champion? Who knows? But I am less unconvinced than you! Naturally I will compare Vettel with Speed since he was the one to replace the American, Punter, and I will be pretty hard on him too - if only to balance the exaggerated hype the youngster seems to be getting. If it's too early to rubbish him, it's also too early to make huge claims for him. For us to compare "rookie" drivers we must look at the meaning of rookie. Is it fair to say that Vellenueve was a rookie in his first year? He had a few years of CART first. So what I do is us their age as a barometer. I like Hamilton but he is not my favorite driver. Having said that I feel confident to say that no 20 year old driver impressed me more than LH. His youth and arrogance kept him from the championship. But it is his youth that ensures that he will be back. I also have to look at the equipment that LH had at his disposal. Imagine how Vettel may have fared in such a car? We all have to us guidlines to judge these young drivers. I think the fact that we can have discussion about so many young drivers says alot for our sport!! Rookie seems to mean those who are in their first year in any particular formula. I agree that, in some ways, it was strange to call Villeneuve a rookie after all the experience he had in other formulae - a bit like calling Michael Schumacher a rookie if he decided to drive in Champ Cars. Yet each form of racing is different and requires different skills; many drivers who have done well in the lower formulae fail in F1 and, occasionally, one will succeed in F1 after being merely average in other formulae (Mansell was one). So I think it's more than just age that makes a rookie. The matter of how Vettel would have fared with Hamilton's McLaren is really what I'm getting at in the article - I don't think any of this year's rookies would have done as well even had they had access to the same car. That's a subjective judgment based mainly on how they fared against their team mates and is all we can do without actually putting them in the car. And no doubt we could argue each case until next season begins! You are right Clive we could argue this forever. But I think it is safe to say that all the rookies would have performed better in a McLaren. How long do we have to wait (how many days) for the first race so we can get back to some intense disagreements and/or arguements. March 16 2008 - that's the date of the Australian Grand Prix that kicks off the new season, John. Seems an age away, doesn't it? Vettel is too young and too fresh to comment on. His performances in Japan and China were sure helped by wet track, they also could have been just the flashes of brilliance. Need to wait for 2008 to see what he does in 2nd season. Sutil has been hidden at the back of the grid, but just the fact that he attracts so much attention from media and fans is a sign that he did something right. On the other hand, he did outperform every single team mate Spyker gave him, but we also need to look at who those team mates were - Albers, Winkelhock, Yamamoto... I would definitelly like to see him either in a better car so gets a chance to fight it with guys higher up the grid or matched with stronger team mate at least. Ah, you spotted the deliberate mistake, Milos! No, actually it was brain fade, I'll admit it - it's those brooding pine forests in the back ground of both circuits - give them the same atmosphere. I'll fix it. Otherwise, I think we're in agreement on just about everything. Especially Nakajima - given that he wasn't rated at all before he stepped into the Williams in Brazil, I think he did an excellent job, improving all weekend followed by an impressive debut race. Davidson's "lack of FLAIR"??? You mean FLAIR like Kimi? "luck has a part to play in the making of a driver" ..... You're right! ... that's why Hamilton did so well, he was "lucky" to have his education paid for by McLaren. Lil Ant had to train in Honda's for 4 years and what did he get for it ...... #23 Super Aguri. I would like to see Hammy in the Super Aguri and Davidson in the McLaren. I wonder how different they really are? If life was fair, Davidson would have been rewarded for his hard work over the years with a good drive in a competitive car. But life is anything but fair and it handed him an outside chance to shine in a year-old car. And the plain fact is that he didn't - sometimes through circumstances like an errant groundhog getting in the way, sometimes through his own errors. Essentially, he failed in his first task which was to make Sato look slow. Senna entered F1 in a Toleman that was anything but competitive but he wrung its neck until it became at least a platform for his skills - and had Prost begging the marshals to stop a wet Monaco GP so that he could stay ahead of the charging Brazilian. It's a matter of opinion but, judging by what I've seen of Hamilton's driving this year, I believe he would have done the same as Ayrton.